The model BM-3 Belt Misalignment switches are conveyor safety accessories designed to interlock with the conveyor shut down systems in the event of conveyor belt misalignment. They are mounted in pairs, one on each side of the belt with the roller actuator arms positioned approximately one inch from each side of the belt. In the event where the conveyor belt tracks off the idlers in either direction it will cause the roller actuator arm to move, tripping one or both micro switches inside the switch. There are two independent micro switches inside the enclosure, one for alarm annunciation (set at 10 degrees) and the other for shut down (set at 20 degrees) from the normal position. This simple system will protect conveyor belts from costly repairs and downtime due to belt misalignment. 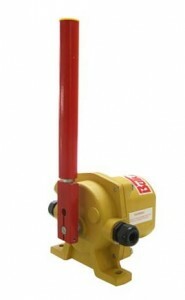 The BM-3 Belt Misalignment Switch can be ordered in standard and CSA approved versions. The CSA approved version is also approved for Class II, Div. 1 & 2, Groups E, F & G.